"I am so very proud of Austin for fighting for our freedom and his time spent protecting us. I love sharing Austins stories with Kallen his 5 year old son. Austins goal was to come back to Texas so he would be close to Kallen and work within the police department with a specialized unit. I am a proud mother of My True American Soldier and I cherish all of Austins 19 years; his childhood memories are the most important to me . I Love sharing Austins military life with his son Kallen. But the little trinkets of his live and personal items bring me the most comfort. One of our favorite things to do was to spend time at deer camp every Thanksgiving (this is one of our last times together as a family). Austin just loved being outdoors fishing, camping and hunting. We so cherish his bobcat he shot. It sits in our living room as a bold reminder of Austins life. Kallen enjoys some of the same things his dad enjoyed. When you put your personal story out to the public it does make you vulnerable to others as well as your own feelings...This needs to be done so OUR boys can live in your hearts FOREVER as well. All of our Gold Star Families will forge forward and complete our boys mission. Our soldiers help to make our world a better place with the help of our Lord. May our boys bring you joy. We miss you so Austin, working hard here to keep our boys close to us and hope all will enjoy our prayer garden at Soldier Spring Park. Our prayer garden will be healing for our hearts as well as yours." Austin was my first Grandson and I had the privilege of keeping him often. We had a special bond because of this. When he became a teenager he and his cousins spent many weekends with me. Jumping off the top of the house into the swimming pool. Going to the creek rolling in the mud and wanting me to let them walk around the neighborhood were just a few of their antics. At the time this Nana would get really mad and now they are precious memories. He was a loving and caring young man that had a special love for his Mom. He will never be forgotten. 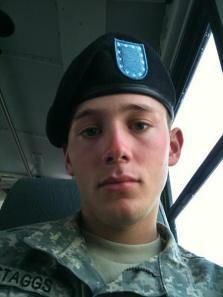 ARMY PFC AUSTIN G. STAGGS - Was born January 11, 1991. Austin was assigned to the 1st Squadron, 61st Calvary Regiment, 4th Brigade Combat Team, 101st Airborne Division (Air Assault), Fort Campbell, Kentucky. Austin was born in Fort Worth, Texas and spent time with his father Byram and his half sisters Emily, Sarah & BJ on summer vacations. Austin was a Fire Support Specialist who joined the Army in September 2009 and arrived in Fort Campbell In February 2010. He deployed August 25, 2010 for his first duty overseas. Killed In Action on November 29, 2010 in Afghanistan.